Your inner voice has a significant impact on your thoughts, feelings, and behaviors. Self-talk also has a direct influence on your self-image. If the constant recording playing in your mind consists of self-limiting beliefs from the past that are reinforced by self-deprecating input from the present, the damage can be disastrous. Most of the time, you are probably unaware of the negative ongoing and internal chatter, as much of it happens in your subconscious mind. However, over time, this negativity can shatter any hope of striving to achieve your dreams. As your actions are a result of your thoughts, replacing negative self-talk with positive input is fundamentally important. Although it may take a lot of hard work, changing the way you think will allow you to change your actions. If your mind has been trained to think negatively, practicing positive self-talk can easily slip your mind unless you make it a habit. At first, it may sound and feel ridiculous, but if you keep going with it, positive self-talk will come naturally to you. 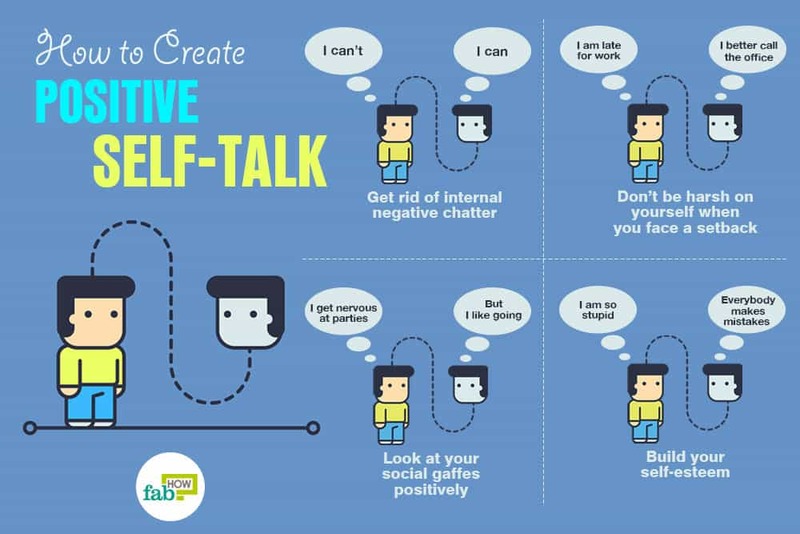 Here are some steps to help you practice positive self-talk and have empowering thoughts. Get rid of internal negative chatter. To change your self-talk, you need to become aware of the negative chatter that runs through your mind. When you say negative things to yourself, your mind will prevent you from being successful at the task. The next time you catch yourself saying “I can’t” follow up with the question, “Why can’t you?” Do this each time you find yourself saying something negative. 2. Distance yourself. Using statements like “Why am I so anxious?” or “How can I improve myself?” may increase your feelings of anxiety or embarrassment. Instead, address yourself using your name, or in the second or third person. Ask yourself, “Why is Mike so anxious?” or “How can you improve yourself?” By doing this, you create a psychological distance from your thoughts to help regulate your emotions. 3. Snap at your negative self-talk. When you find yourself listening to your negative self-talk, stop your thoughts in their tracks by saying “STOP!” Saying it aloud will make you aware of the action. If you’re somewhere that you cannot speak aloud, just pinch yourself each time you get engaged in negative self-talk. The physical pain will motivate you to snap out of it and stop it altogether. 4. Don’t be harsh on yourself when you face a setback. When things go wrong, avoid criticizing yourself. For instance, when you’re running late for work, don’t tell yourself, “I am late for work. 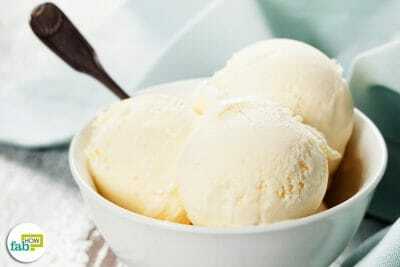 Now I will have to face the wrath of my boss.” Instead, practice positive self-talk and tell yourself, “Its ok. It is not as bad as I think. I am still a good person.” By doing this, you are telling yourself that it’s not a catastrophe and that you will overcome this inconvenience. 5. Look at your social gaffes positively. People often flounder in social situations. When something embarrassing happens to you in a social setting or if you feel nervous, practice positive self-talk to get over it. 6. Share your faux pas with someone. Shame has power only if you keep it a secret. Thus, talk about your goof-ups with a friend or someone you trust that will be supportive. You will discover that these conversations often end up in laughter, making you feel better. 7. 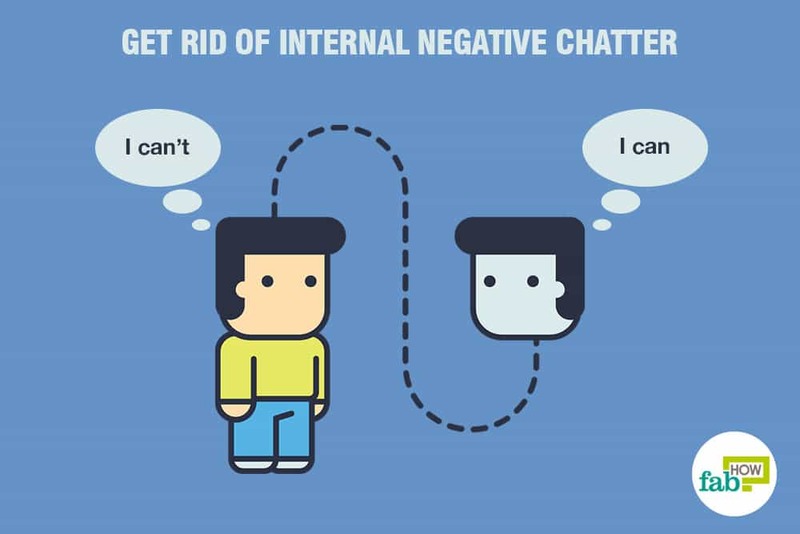 Keep a tab on external negative influences. Identify external negative factors that influence your thoughts. It could be unsupportive or negative-thinking friends or family. If you are not careful, you might end up adopting their negative thoughts. Limit your exposure to such people. Instead, surround yourself with encouraging and positive people who lift you up and help you grow. Their positivity will start nudging your thoughts in a positive direction. 8. Face your fears. Fear holds you back from attaining success. You may be afraid of leaving your comfort zone and taking chances in life. Ask yourself what you are afraid of. When you confront your fears, you may realize that often the worst-case scenarios are not as bad as you think. Break down your fears and see if you can look at things more positively. When you start seeing that the benefits of change are worth taking risks, you will start changing your negative self-talk. 9. Build your self-esteem. If you are used to being harsh on yourself, you may generally be aware of the times when you beat yourself up with self-talk. Make a conscious effort to use self-talk to build your self-esteem. Speak to yourself in an encouraging and positive manner. For instance, you might usually call yourself stupid when things go wrong. Instead, remind yourself that everybody makes mistakes and that experiences – positive and negative – help people grow. 10. Use positive affirmations. Affirmations are positive statements related to the desired goal. By repeating them over and over again, you are making your subconscious mind believe them. Don’t just merely repeat the affirmations. You need to have complete faith in them. Make a daily ritual of repeating these affirmations, and you will begin to think and feel differently. 11. Say three positive things to yourself daily. Look into the mirror and say three good things about yourself. Compliment yourself. It could be about your accomplishments, abilities, traits or your appearance. Practice positive self-talk daily to help boost your self-image. 13. Change “I can’t” to “I don’t.” Saying “I can’t” imposes limitations. However, when you say, “I don’t,” it shows your control over your thoughts and behaviors. “I can’t” sounds as if you want to, but you are forcing yourself not to. “I don’t” is empowering because choosing not to do something because you think you should not do it or simply because you do not want to. 15. Create positive scripts. Create something like a movie script about things you want to achieve and let it run in your mind. Use some visualization as well. For example, imagine yourself achieving your career or family goals, or accomplishing things that make you happy. When you do this, you start internalizing the goals and outcomes. You start feeling as if you have already achieved them, and it can prompt you to take action that will move you toward your goals. 16. Focus on changing your present. When you notice your mind is caught up in anxiety about the future or regretful moments of the past, shift your focus to the present. Ask yourself, “What can you do right now?” You cannot control your future or change your past, but you can take steps to affect your future by taking actions in the present moment. 17. Focus on happy moments. Focus on life’s good and happy moments, rather than the difficult ones. You need to remind yourself that life has its ups and downs. Fill your mind with positive thoughts and images. Whenever your mind goes astray, bring it back to joyful moments. Another thing that you can do is be grateful for what you have presently. When you are grateful, negative self-talk will also change to more positive talk. Sometimes an act of kindness or helping others too gives you a happy moment to cherish and the positive boost you needed. 18. Relax your standards. It is relieving to let go of insanely high standards. Perfectionism is destructive. Be willing to mess up and move on in life, without being harsh on yourself. 19. Be persistent. Your negative self-talk may have been going on for decades, so it won’t be easy to change that habit. You cannot make it happen overnight. You have to be persistent, and it will require effort. Make it a habit to practice positive self-talk every day. Once it forms into a habit, it will become second nature. 20. Love yourself unconditionally. Everyone has something that they want to improve. Your imperfections should not stop you from loving yourself. You should love yourself for who you are, rather than for what you have or things that you have done. Love yourself for your uniqueness, your personality, character traits and for everything that you are. The more you love and accept yourself, the easier it will be to practice positive self-talk.